In deference to the culture which I am now in, I went out for afternoon coffee at the neighborhood coffee shop. (Usually I only have coffee in the morning.) In further deference, I selected a piece of pulla to have with my coffee. The taste of the finely-textured, semi-sweet dessert bread with the distinct taste of cardamom brought back memories of mummo Anna (i.e., Grandmother Anna) that would make it at my house several times a week when I was growing up. This was some sort of specialty pulla given related to the upcoming Easter season, and this had both berries and a glaze and a splash of powdered sugar. 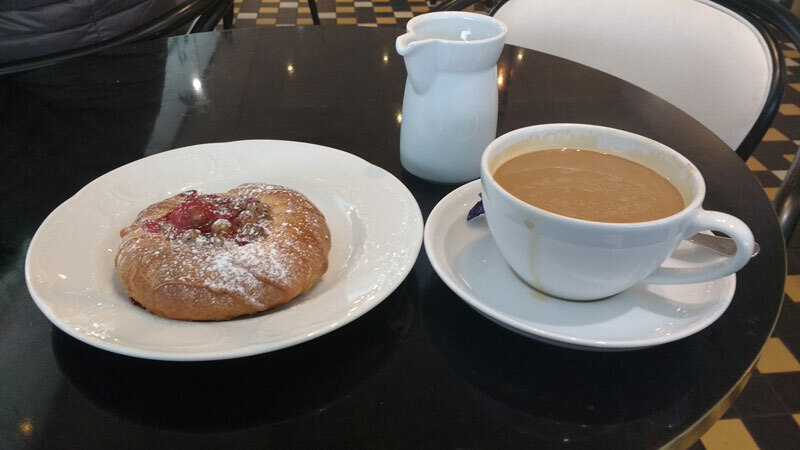 I had never eaten a pulla like this, but it was quite a treat with the coffee–which, in deference to my origin, was an Americano! Note to dad: I did not, however, dunk the pulla in the coffee.